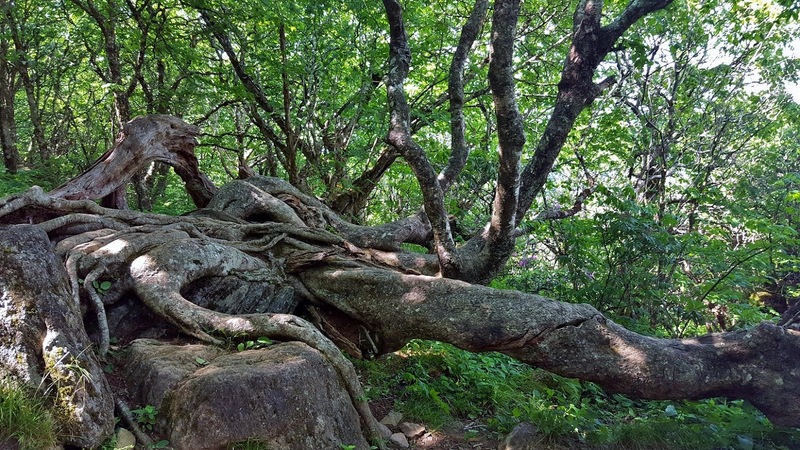 Craggy Gardens Rhododendron - Take a Hike! This past Saturday, I headed to the Craggy Gardens area of Blue Ridge Parkway for some hiking and to see the rhododendron blooms. For Memorial Day, Sandy and I had gone to Roan Mountain, perhaps the best place to see rhododendron blooms, but it was too early back in May. So this was a great opportunity to see the beautiful rhododendron flowers. I met Justine and the others in Chapel Hill and we drove out towards Asheville. 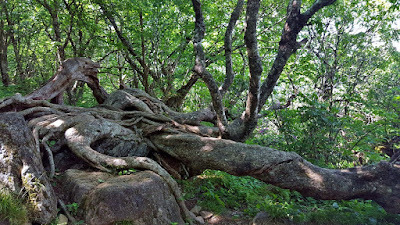 On the Blue Ridge Parkway, it was 15 miles or so to the Craggy Gardens Picnic Area. Our plan was to hike the Snowball Trail (#170) into the Big Ivy area of Pisgah National Forest. We stopped at the picnic parking area, but then drove back down to the trailhead by the gated Stoney Fork Road. We hiked a short ways on MST, then turned right to follow the yellow-blazed Snowball Trail. Initially, the trail headed straight up the side of Snowball Mountain. Fortunately, it was a little chilly at this high elevation and there was a nice breeze to keep us cool for the hike up the mountain. The summit of Snowball Mountain is forested, so not much in the way of views. We then continued down the other side and headed up the next mountain – Hawkbill Rock. It was a bit of a scramble up to the top and then a side path led to an overlook with great views of the valley below. We had a quick snack break and then continued on. Eventually, we went down from Hawkbill Rock to Snowball Gap and then back up Little Snowball Mountain. There was an interesting mushroom growing along the side of the trail, but I'm not sure what it was. The trail skirts around the summit of Little Snowball and continues on to a false summit where the fire tower used to stand. Along this area, we saw some beautiful flame azalea blooming. At the end of the trail, was a small open area where the lookout tower used to stand. This tower was slated for demolition, but a concerned citizen bought the tower, dismantled it, brought it down the mountain and reconstructed the tower. Now all that remains are some cement structures where the tower once stood. These blocks made a nice seat to eat lunch. And there were a lot of daisies and other wildflowers blooming at the spot. After lunch, we made our way back. I quickly ran up to the summit of Little Snowball Mountain to make sure there was nothing else here – there wasn’t, just a very overgrown campsite. Then we made our way back towards the cars. It was mostly uphill on the way back, except for the last stretch coming down from Snowball Mountain. On one part of the trail, a mother bird flew out of her nest right next to the trail. It wasn't hidden very well. I got a quick picture of her babies and then continued on. Back at the cars, Justine and the others were camping and heading further west. I had to be back to Raleigh for Fathers’ Day, but wasn’t quite ready to leave the mountains yet. I stopped at the Craggy Gardens Visitor Center, planning to hike along the Mountains-to-Sea Trail for a bit. The views here were very nice looking into the valley below. High above, I could see Craggy Pinnacle towering above. It looks very scenic and I opted to hike here instead, so I drove a little further to the View Craggy Dome parking area. From here, I made the short hike up to Craggy Pinnacle. It’s a popular trail and many other people were on the trail and overlooks. The beautiful Catawba rhododendron were blooming all over the mountain. A few trees were here, very gnarled and twisted from the harsh conditions at this high elevation. Although it’s uphill, it's an easy gradual slope and I stopped several times for pictures, including a lovely tunnel of mountain laurel. I first went to the upper overlook at the summit of the mountain. With 365° views, this is one of the most scenic places on the parkway. Just past Craggy Gardens, I could see Snowball Mountain, Hawkbill Rock, and Little Snowball Mountain and figured out where we had hiked earlier. In the other direction, I could see the might Black Mountains towering in the distance. I then headed down to the lower overlook, which had nice views as well, but not as spectacular as the upper overlook. After that, I started heading back to the car. From across the parking lot, I could see Craggy Dome towering above at more than 6000 feet high. After a couple more pictures, I started making my way home.